Die-hard Sydney Swans fan Sharryne Daley (right) shows her support in the crowd. Ever since I was a young girl I’ve known the players’ names, I’ve hung over the fence and I’ve lived and breathed the Swans. When I wasn’t able to go to the footy as a little kid, I’d be lying on the floor writing letters to Bobby Skilton that I’d try to hand him over the fence down the track. In this series, we uncover the moment when passionate Swans members fell in love with the red and white. When heaven calls, full-blooded Sydney Swans supporter Sharryne Daley will be cremated and have her ashes sprinkled around the Melbourne home of the red and white. 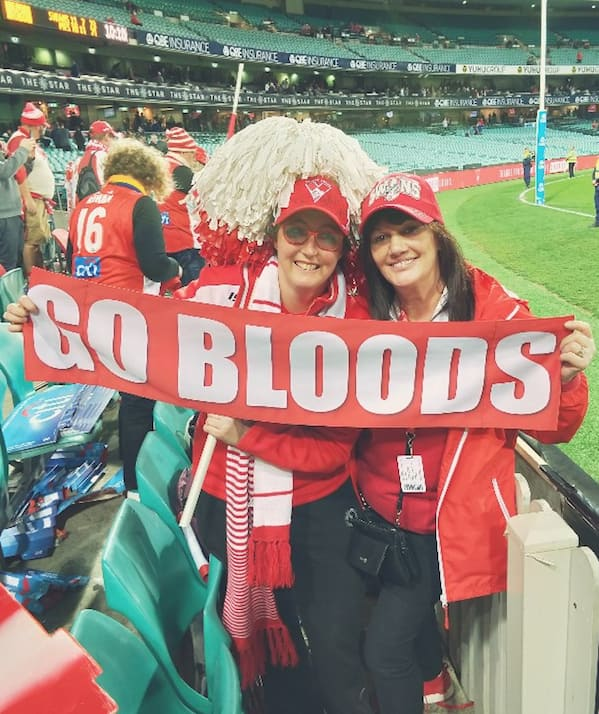 But the driving force behind the red and white sea of ‘GO BLOODS’ banners hopes to cheer on her beloved Swans for many more years to come. Daley’s life revolves around the Swans and it was a clash with Hawthorn in Round 12, 1967 that sparked the maniacal affection. A six-year-old Daley draped herself in red and white from tip to toe, skipped off to Lake Oval with her dad and planted herself among an 11,323-strong crowd on a Saturday afternoon to cherish. South Melbourne fell to Hawthorn in a 13-point defeat as Daley caught a glimpse of exalted Swans Bob Skilton and Herbie Matthews, but the father-daughter outing would do enough to light a flame still burning with gusto today. “There are no words to truly describe my love for the Swans,” Daley told Swans Media. Daley grew up in a family of six in South Melbourne and, with her mum and younger brother and sister supporting Footscray, there was every chance she’d turn her back on the red and white. But Daley, whose dad and older sister were fanatical South Melbourne supporters, sided with the Swans and has never looked back. Through-and-through Sydney Swans supporter Sharryne Daley hoists her 'GO BLOODS' banner as Ben Ronke celebrates a goal. Her childhood memories are dominated by cheering on the Swans with godfather and former South Melbourne centre half-back Jack ‘Basher’ Williams, who amassed 61 games in the years spanning 1939-1940 and 1942-1946. ‘Basher’ took part in the 1945 VFL Grand Final remembered as ‘The Bloodbath’, a showdown between South Melbourne and Carlton packed with uncontrollable fights. Thirty-five years later, a nine-year-old Daley watched on as the Seven Network broadcast the Brownlow Medal count on TV for the first time in history in 1970, feverishly jotting down the names and total votes of every player announced. And when Bloods Legend Peter Bedford claimed the prestigious honour, she cried tears of joy for her favourite Swans player of all time. Daley, who grew up in South Melbourne and now lives in Mills Park with her husband Mal, says it was a conversation at the 2018 Guernsey Presentation and Hall of Fame Induction Dinner that inspired the ‘GO BLOODS’ banners. Daley unveiled the first of its kind as Sydney met Richmond at Docklands Stadium in Round 15 last year, and the squad of banner enthusiasts has since grown to more than 700. The Swans’ 2017 number one ticket-holder, Pat McLindin, calls the wave of banners “a tsunami”. “I was at last year’s Guernsey Presentation and Josh Kennedy was speaking on stage about our fans getting louder and louder,” Daley said. “I’m very friendly with Peter Bedford, and I had spoken to him before that night about our fans getting louder, so then on the Guernsey Presentation night Peter came up to me and asked what I thought of Josh’s address. So that was the catalyst for the ‘GO BLOODS’ banners. “Then I started trying to design something out of old table cloth, and when I thought I’d found the right design I contacted several suppliers. I was then an admin for a Swans supporter group, and I look at this as my idea, but to me it’s also a whole supporter initiative. Daley is now 58 and has strained her vocal chords through countless ear-splitting renditions of the club song, but the banner-hoisting Swans die-hard won’t be quietening down anytime soon. She’s hoping to sing many more club songs between now and the day her ashes settle in red and white territory.